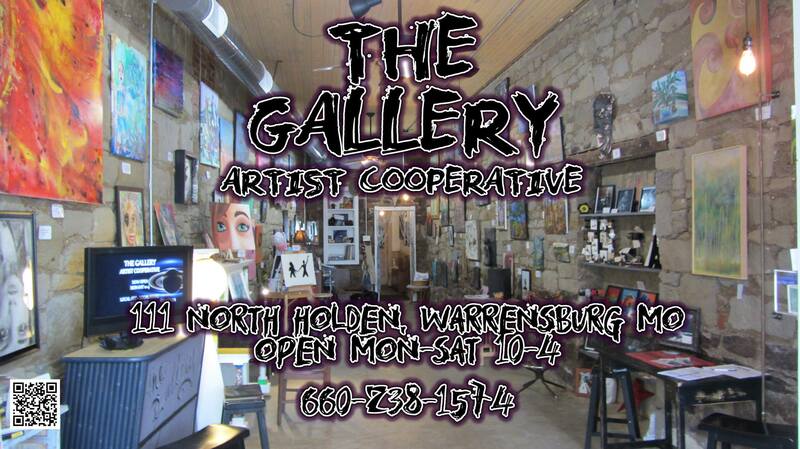 The Gallery Artist Cooperative, a small art space located at 111 N. Holden Street in Warrensburg, Mo. is a place where creations by local artists are on display and available for purchase. The storefront opened in the summer, and just a few months later, the building still stands, as awareness of a budding arts scene in the area continues to grow. The latest endeavor associated with The Gallery is a crowdfunding venture via GoFundMe. It allows for unaffiliated individuals, businesses and artists to financially support The Gallery at a relatively low price. Sponsorship is divided into three tiers. The Business Benefactor level of $30.00 a month includes sponsorship in all advertisements, including a billboard in the gallery. Artist Membership level is at a cost of $25.00 a month with perks that include the ability to sell and display art in the galley devoid of a consignment fee. The sponsorship level of individual community benefactor at $10.00 a month and includes members only events and special sales. Jay Linhardt, who has been one of the driving forces behind The Gallery and The First Friday Art Walk, was able to explain the reasons for recently adopting crowdfunding. Reflecting on the past is how Linhardt came up with the idea for crowdfunding. “When we first started out, it was just like a handful of us funding the gallery, which is understandable,”Linhardt said. Linhardt is of the mind that crowdfunding the gallery is a way to emphasize a cooperative element. He said the crowdfunding is a way to spread the cost of the gallery at a minimal cost. He is someone who believes in strengthening community ties in order to further the expansion of the arts community in Warrensburg. Even though Linhardt acknowledges that the arts community is spread thin in a smaller area, he also believes a connection is being forged between similar, yet disjointed, segments of the scene. “Mainly, the people involved are forming and rearranging groups and communicating better between each other,” Linhardt said. For more information, follow The Gallery Artist Cooperative on Facebook here.